The following information has been prepared to make your BRAN ride safe and more enjoyable. If you are an experienced cross country cyclist, you should be prepared for the rigors of the ride. If, however, you are like the majority of the BRAN participants, the ride may be a stress on your mind, your equipment, and your body. 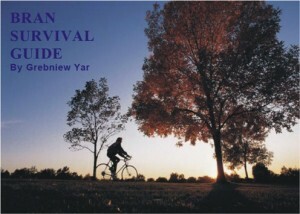 This BRAN Survival Guide was designed to help you be more prepared for a safe and fun ride. The following pages suggest some sound ideas for preparation for BRAN and prevention of common problems. This guide is not intended to replace the advice of your physician or local bike shop. It is our hope that you have a safe and enjoyable week on the road!! BRAN has earned a reputation as a safe event. Part of this reputation is due to the hard work of the ride organizers, but the majority of the credit goes to the participants who respect the rights of others and ride safety. As a BRAN rider you have an obligation to help maintain this safety record. You are an ambassador. All riders are expected to adhere to the following rules and safety tips. Gray Matter – BRAN rules require all riders wear a hard shell bike helmet while on the route (it’s also a good idea to wear a helmet when riding around in overnight towns). Whenever you are on your bike (on the route, in camp, in town) wear your helmet. Route – Each year BRAN takes a different route across the state. This is planned. Please don’t you take a different route from the designated route. A lot of work went into preparing maps for the ride; please follow them. If you go off the published route, we can not provide you roadside support. Remember, NO SHORT CUTS! BRAN attempts to mark most major road hazards, but we can’t insure everything gets marked. Remember to stay alert, ride defensively and always protect yourself. BRAN is not responsible for injuries you might sustain on the ride. Rider Courtesy – Let other riders know you are passing them by loudly stating “on your left”. Also, be sure to say “car back” when you notice vehicles approaching you from behind. Use arm signals to indicate turns. If you take a rest stop or are stopping at a SAG, check behind you and then pull off the pavement. Pelotons – Nebraska Law requires that you ride single file as far to the right as practical. Observe extra caution when riding with a large group. Most BRAN accidents include two cyclists colliding with each other. Drafting other riders or pace lines are discouraged. Drafting motor vehicles will result in your being removed friom the ride. Four (and more) Wheeled Friends – Always allow motor vehicles to pass. Do not block traffic. Remember, they have a distinct weight advantage over you. This is especially true for semis. Remember blow-by can knock you off your bike into the ditch. Not everyone who drives are friends of cyclists, but if you are doing what is right, perhaps we can win a few over. Night Moves – Don’t ride in the dark!! If caught on the route before dawn or after sunset, we will pick you up – so will the law. If you ride at dawn or dusk, flashing red strobe lights are required. Electrical Shows – If caught in a thunderstorm, get off the road immediately and take cover (not under a tall tree). Bikes and riders make excellent lightening rods. We do our best to keep BRAN riders informed of impending weather. Please follow our instructions. Railroad Tracks – Don’t jump railroad tracks. Always try to cross tracks at a 90 degree angle. To give your frame a break, take your weight off the saddle and coast across the tracks with your knees and elbows bent. If tracks are wet from rain or dew, it is better to dismount and walk your bicycle across them. Be careful!! Canine Critters – Most encounters with dogs can be handled by sprinting away. Also, loud noises when the dog is close will scare it away. iPods and Phones – CAUTION!! It is important that you are aware of other bikers and motor vehicles. We highly recommend you DON’T ride with ear buds while on BRAN. Give your full attention to riding. Road Cracks and Debris – Take all cracks on a 90-degree angle. Point out potholes, broken glass, and other hazards to those behind you. Defense – Your personal safety requires a totally defensive style of riding. Most accidents occur toward the end of the day or the end of the week’s ride, when people are tired. Stay alert. Backtracking – BRAN discourages backtracking. That means no going against the approved route. This is a particular problem on a two lane road with no shoulders. If a car comes upon two riders going opposite directions, something has to give. Please don’t backtrack! Remember, the ride is safe, only if you make it safe. Don’t spoil the ride for others. On BRAN you ride at your own risk. Neither BRAN nor the Omaha Pedalers assume responsibility for you or your bicycle. It’s Your Responsibility! So ride safely and have an enjoyable journey. A rider prepared for BRAN will generally have a much more enjoyable ride than one who is not prepared. Preparation involves both yourself and your equipment. The following guidelines should help you get ready for your week on the road. Equipment Check – It is strongly recommended that each rider have a quality bicycle. If you are not knowledgeable about bicycle mechanics, take your bike into your local shop and have them check the following items: headset and bottom bracket tightness, brakes, shifting system including front and rear derailleurs, hub adjustment and wheel adjustments and wheel trueness, tires, and lastly check the chain for excessive play. It’s no fun to be broken down when everyone else is riding. Remember, an ounce of prevention is worth a pound of cure! Bicycle Set-Up – While at your local bicycle shop, have them adjust your saddle tilt, height, and fore and aft positioning. Simple saddle adjustments can save you from major knee, back and shoulder problems. Also, have them look at the positioning of your handlebars for proper stem length. Lastly, if you wear shoe cleats, be sure you have your cleats and/or toe straps adjusted for a proper fit. Most bicycle shops will perform this service for a very reasonable fee – especially if you bought the bicycle from them. Miles, Miles, and More Miles – BRAN registration materials recommend riders have a minimum of 300 miles in training rides during the months preceding the ride, including at least one ride of 70 miles of more. These are the minimum miles needed. More is better! Average BRAN days are 60-70 miles. Start training with 15 to 35 miles weekend rides gradually leading up to 70 plus mile riders. If 300 miles are recommended, it’s best to try to shoot for at least twice that amount. In increasing distances of your weekend tours, try to aim for a 15 to 20% mileage increase per week. Long, slow distance conditioning miles are important for proper development. Remember, it’s duration not intensity of exercise that counts! Gear Selection and Cadence – too often a beginning bicycle rider will push too high a gear (hard to pedal) in the hopes of moving along at a fast pace. Grinding high gears will result in more speed, but at the expense of your knees. In the early season, riders should select low gears (easy to pedal) and maintain a cadence (the number of crank revolutions) of 75-90 per minute. Spinning easy gears will bring your heart rate up, help your pedaling motion and save your knees. As you get in shape you will be able to jump up to higher gears and still maintain your cadence. Training Effect – By selecting easy gears, you can reach your training heart rate. This is the heart rate at which you are getting optimum training effect. To calculate your training effect heart rate, you must first calculate your resting and maximum heart rates. This can be accomplished by measuring your pulse rate over a 15 second period and taking that number times 4. Learn to take your pulse by pressing fingertips against the carotid artery, which is located in the neck. Your maximum heart rate is calculated by subtracting your age from 220. For, example, for a person 30 years old, the maximum heart rate would be 190 (220-30). Your ideal training heart rate can be found by subtracting your resting heart rate (for example 70) from your maximum heart rate (190) and taking 75% of the result (190-70 x .75 = 90). Adding that back to resting hear rate of 70 yields a training effect heart rate of 160. At this heart rate, you are getting the maximum aerobic fitness for your time spent on the bicycle. Early in your cycling program, you may wish to use a 60% factor gradually working up to the 75% factor as the season progresses. Warm Up / Cool Down – You just can’t jump on your bike and get your heart rate up to the training effect without some toll on your body. For that reason, it is highly recommended you have a 10-15 minute warm-up period where you gradually increase your workload and the same amount of time toward the end of your ride to gradually decrease your workload. The warm up / cool down has a dramatic effect on reducing overuse injuries. Posterior Preparation – BRAN is not the time to break in a new seat. Remember at the end of the week, you will have developed a very fond relationship with your bicycle seat. Proper conditioning of yourself and your bike will make BRAN a much more enjoyable ride for you. We recommend either saddle soap or dry powder to keep rash and sores from ruining your ride. Often we don’t think about nutrition during a ride, but it can play just as big a role as our equipment and training. With this in mind, we would like to give you some nutritional guidelines that should make your ride smoother and more enjoyable. Calories Count – Going on a long distance bike tour may sound like a good way to lose weight, but is certainly no time for dieting. Bicycling burns somewhere between 250-850 calories per hour, depending on your body size and the speed you ride. A person may need over 6,000 calories a day just to maintain weight during all day touring. This amount of calories cannot by comfortably consumed in just two meals. The best way to get in those calories is through several – at least three – meals a day with snacks. Taking in an inadequate amount of calories, especially in the form of carbohydrates, will cause fatigue. One of the body’s main fuel sources during cycling comes from the glycogen (carbohydrate) stored in muscle and liver. When these stores reach minimal levels it’s known in cycling terms as “bonking out”. Adequate calorie intake is, therefore, of prime importance. Carbs and More – To help maintain adequate glycogen stores throughout the ride, some suggest a relatively high carbohydrate intake is recommended. Others have found they perform best without carbs, preferring protein over carbs. We suggest you know your body the best and what works for you. Whatever your choice, make sure you’re ready to ride and eating enough throughout the day. Do not count on the SAG stops to feed you, they are stationed more for rider support and resting areas than food stops. H2O – To make your ride as pleasurable and comfortable as possible, drink plenty of water before, during, and after riding. Rely on fresh citrus fruits and juices, dried fruits, potatoes, tomatoes to obtain adequate potassium. Vitamins and Minerals – It must be kept in mind that no supplement, no matter how many vitamins and minerals it contains, will make up for a poor diet. Only through foods, can we get the calories we need, and serious bikers need plenty. In fact, most vitamins and minerals are absorbed better from food than from supplements. The best assurance for getting adequate amounts of vitamins and minerals is through a varied and balanced diet. If a supplement is necessary, use it to help rather than hinder performance. Before embarking on BRAN, each rider should be in reasonable physical shape. It is a good idea to visit your physician if you think you may be susceptible to any unusual medical problems on the ride. Even those of us in excellent condition however, experience some medical problems associated with long days on the saddle. The following information is designed to help you cope with those problems in a safe manner. Sunburn – The best treatment from sunburn is prevention. It’s important to know that your greatest risk of being burned will be between the hours of 11 AM and 3 PM. Being near a reflecting surface such as a highway or body of water can increase the risk . . . as can wind, heat, and high humidity. Oils can intensify the sun’s effect also. It’s recommended to use an effective sunscreen with an SPF of 15-30 or higher. If you do become burned, you’ll find many non-prescription sprays and lotions can provide some relief. Be aware, however, that the relief lasts only for a short time, and that reapplication will be required in 10 to 20 minutes. Aspirin and Tylenol are effective for relieving pain, and ice packs also can be very useful. If the burned area is fairly small, you can use any of the readily available over-the counter cortisone preparations or aloe vera. If you blister, please see someone from the BRAN staff so proper medical attention can be arranged. Popped blisters can easily lead to infection if not treated properly. Dehydration – The vigorous physical activity you are experiencing as a BRAN rider can rob your body of needed fluids . . . even before you become aware of potential dehydration problems. Therefore, it is essential to replace fluids lost through perspiration and evaporation. Water is the simplest, more available and least expensive replacement fluid you’re likely to find. Of course, other fluids, such as soft drinks, fruit juices, and tea are fine, as well. The most important thing to remember is to drink adequate quantities of whatever solution you prefer. Remember, that tea, coffee, and many soft drinks contain caffeine, and that consuming large quantities may have some side effects. Also, consuming alcohol while on the route is not a good idea. Too many beers on the route or in camp can lead to dehydration. Begin the day by drinking several glasses of liquid. Juice and water are highly recommended. Even coffee is acceptable. Once on the road, you should drink at least one bottle of fluid each hour. It is strongly recommended flavoring the water with a powered mix or liquid flavors as they may make the water more palatable and desirable. In situations conducive to dehydration, such as high winds, high temperatures and extremely vigorous activity, take a least one bottle of fluid every half hour. At the conclusion of your day on the road, be sure to drink plenty of replacement fluids. We are all subject to the effects of dehydration. Dehydration will affect your mental and physical abilities. Heat disorders – Increasing your body’s core temperature through vigorous exercise can result in various disorders ranging from minor symptoms to life threatening problems. Common symptoms of overheating may include nausea, light-headedness, weakness, confusion, and abdominal cramping. Please let others know if you are experiencing any of these symptoms. Do not ride; wait for a SAG preferably in a shaded area. Loss of judgment is also a potentially dangerous problem. The one effective treatment for elevated body temperature is cooling. Stop producing internal heat by resting. Get out of the sun. These simple measures, coupled with replacement of lost fluids, will do the most good. It may also help to wet the affected person down. It there is an apparent change in the person’s mental state, expert medical help should be sought immediately and hospitalization may be necessary. Overuse Syndromes – When we push our bodies beyond our customary level of physical activity, we can expect to suffer some aches and pains. Most are minor, but all require attention and treatment. Important note, should you develop pain during the ride, assess your riding condition. It is not unusual to find that the cure to an overuse problem is some change in your equipment. A seat positioned too low is a frequent cause of pain in the knee, due to the unnatural movement of that joint. Bear in mind, in many cases, you can’t solve your medical problems until you’ve solved your equipment problems. Over-stretching, twisting or a blow to a part of the body can cause sprains and strains. If the injury causes a tear in the ligaments, it is a sprain. If the injury causes a tear in the structure of the muscle, it is a strain. There are varying degrees of both types of injuries, but neither is necessarily worse than the other. Common problems confronting BRAN riders include muscle stiffness, tendonitis, bursitis, bone/ligament stress and for males, numbness. BRAN highly recommends stretching each day before riding. Serious injuries require prompt medical attention. The more common aches and pains however, can be successfully treated on the road. Treatment for most common overuse conditions includes rest, ice, compression, elevation and medication. The key word to remember is RICE. REST – Since you really can’t “work out” these kinds of injuries, rest is essential. Limiting yourself to activities that do not cause pain in the effected area is usually the best action you can take. Avoid activities which are painful, for the pain is the body’s means of telling you that you are stressing an injured area. ICE – Ice should be applied for at least 20 to 30 minutes as soon as possible after sustaining an injury. These ice treatments should continue up to 48 hours after the injury. (Placing a cloth between you and the ice can prevent freezing of the skin). COMPRESSION – The best example of this is the elastic or “ace” bandage. ELEVATION – During the initial 48 hours, elevating the injured part, wherever possible, is also helpful in reducing the swelling. These basic first aid measures reduce the chance of further injury and limit the amount of swelling, thereby reducing pain. And medication – common aspirin is among the most available and most effective medications for pain and swelling. Another useful drug that can be purchased without a prescription is ibuprofen. Though these medications can be most helpful, they may irritate the stomach, and so should be avoided by individuals who have ulcers. BRAN is a heavily sagged ride. Two types of SAGs are along the route, stationary and roving SAGs. Every SAG wagon is clearly marked and contains the following: water supply, fresh fruit or other snacks (donation accepted), first aid kit, bicycle pump. These are certain rules and customs affecting SAG use. There is a designated SAG that will take riders and their bike to camp in case of mechanical or physical break down. The SAGs are not a taxi cabs so you should be prepared to ride every day. SAGs can be signaled by patting your hand on the top of your helmet. If a roving SAG passes you by on the road and everything is OK and you don’t need their assistance, give a nod, but don’t use your hands. Fast riders may not see the roving SAGs too often. The Roving SAGs will generally be from the middle to the end of the riders. The designated SAG and roving SAGs will pick up riders off the route at sunset. BRAN has adopted advance SAG guidelines. In simple terms if you haven’t reached a certain point on the route by a certain time, the roving SAGs will pick you up and take you to that point. Advance SAG guidelines and times will be posted at the luggage truck, at the BRAN Camp Headquarters, and at the individual stationary SAG stops. Late in the day, roving SAGs must cover a lot of miles. Riders are encouraged to give them a wide berth. Also, if it is raining or the ground is wet, roving SAGs sometimes are not able to pull off the road due to soft shoulders. They may be stopped on the road, so please don’t run into them. Be kind to your SAG support! They work long and hard without recompense. They literally carry hundreds of gallons of water and hundreds of pounds of fruit. Although you may not believe it, riding is far easier than SAG support. Stationary SAGs will have weather radios and message boards for the rider’s convenience. Stationary SAG’s are also using their own personal vehicles and trailers so do not park your bike against these vehicles and show respect to their equipment. These people are there to provide water, snacks and other support along the route where they are parked. They will only take riders in to camp in case of inclement weather. They will notify the designated SAG is you are not able to complete the day and that person will come to the Stationary SAG stop to pick you up. Stationary SAGs will also serve as a gear drop. Make sure your gear is clearly marked with your name. Dropped gear will be delivered to the BRAN Camp headquarters for rider pick up. Unclaimed items will be placed into “Lost and Found”. Every evening a nurse will be available for consultation at the BRAN Headquarters. The nurse’s role is to assess your problem, suggest minor self-treatment, and in the case of more severe problems, to refer you to more advanced medical care. The nurse performs only minor first aid. Always complete the medical information card provided by BRAN and bring your health insurance card. Keep these with you at all times. BRAN headquarters will be in a marked mobile home in a prominent location in the campgrounds. The BRAN Camp Director works with our local community to insure an orderly campground. Please follow the instructions of the BRAN Camp Director. The BRAN headquarters serves a number of functions – lost and found, first aid (M*A*S*H), sale of BRAN items, information center and gear drop pick up. The BRAN Director is also found at the BRAN Headquarters. BRAN works with Emergency Management Teams in our locations and they direct BRAN staff regarding inclement weather. The campgrounds will be informed via public address/bullhorns if we are directed to make plans or inform the riders of a threat. When you hear the BRAN horns, you need to take shelter immediately. If you are on the road, seek immediate shelter until the weather passes. Severe Weather Shelters will be identified on the BRAN baggage truck and at BRAN headquarters.